I originally drafted this post at the end of December, but have not been able to finish and post it until now. My first reaction was that of excitement. It won’t be long before I will set foot on Sumatra, reside at the shore of Lake Toba beside some dramatic scenery, and live among a community of women. Yes, soon I will be surrounded by all things Batak. I smiled, and had my own private moment of joy while paying for my tea. North Americans are privileged to have a selection of coffees from the beans grown in every region where coffee is grown. Even though coffee is not grown in the US, we can purchase a blend of Sumatran, Ethiopian, Colombian, or other country any day of the year in a vast amount of coffee shops all over the country. And we can do this without much thought to how it was purchased, who grew it, the culture of the people named in the advert (in this instance, the Batak people), or how it changed hands into North America. 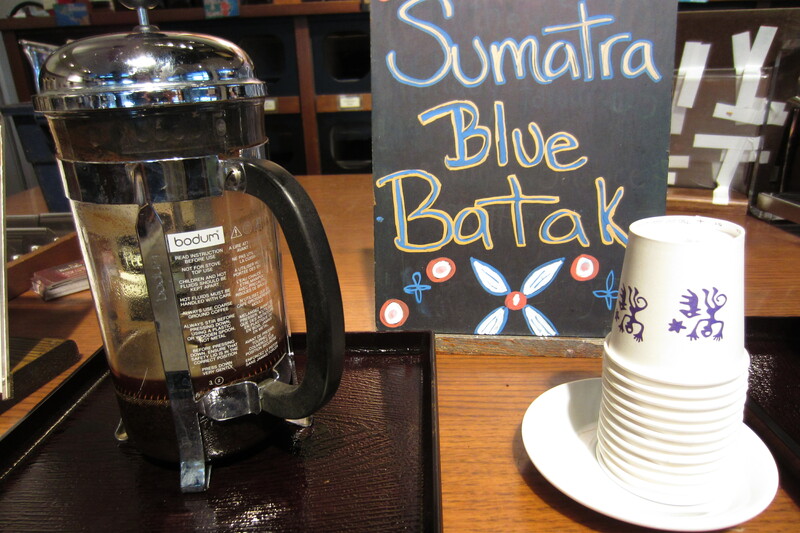 I did not sample the Sumatra Blue Batak blend, although I’m sure I would have enjoyed the taste. Instead, I decided to wait until I am in Sumatra to sample Sumatran coffee. There is more to Sumatra and to the Bataks than coffee, and I hope to listen to and share their stories.